Especially if the candy is free, and there’s a friendly face to talk to for 5 or 10 minutes before you head back to your office. Who wouldn’t go for that? I’ve yet to meet a fundraiser who isn’t game. Which is great, because I’ve heard many a prospect researcher lament that getting meetings with frontline fundraisers is a tough task. Sure, they’re out on the road a lot (that’s their job, after all!). But we like to hear how our research efforts turned out, right? We want to know if our estimates were right, or even close. We want to know if the information we found was helpful. Useful. Or totally off the mark. But getting that kind of feedback can be tough. When a fundraiser comes back from their trip, they’re on to the next thing. Briefing a researcher probably isn’t tops on their to-do list, especially if they have 15 contact reports to write. A fundraiser may not even know that a face-to-face how-did-the-meeting-go? download is something their research partner wants to be on their to-do list. We researchers tend to be an introverted crowd, and meetings aren’t our thing, so we might not suggest it. Also we’re up to our eyeballs in research requests and event briefings so we probably wouldn’t want another scheduled half-hour meeting anyway. But a 5 minute catch up? That’s completely do-able. But how to engineer it? Hmmm. A candy dish works special magic. Around 2 o’clock in the afternoon, candy dishes start sending out invisible vibes to people near and far. By 3:00 it’s got one of those silent dog-whistle things going. And if there’s a particular person you’d like it to call to, you can always help it out. Maybe you haven’t seen Regional Gift Officer Dave in a while. I hear Dave is a sucker for Dum Dums. I’m pretty sure Patty the VP’s favorite candy is chocolate-covered peppermint. You get the idea: Sweeten the pot. Candy’s always a good topic for conversation, too, so if you don’t know someone’s preferences, it’s pretty easy to get them talking about it. It’s a good bonding topic. And nobody doesn’t like candy. I know setting up a candy dish involves an outlay of cash, but you can always grab post-Halloween/Christmas/Valentine’s Day/Easter two-for-ones. Candy has a pretty sweet shelf life, too, but if the cost ever becomes burdensome, stop the second you feel resentful at being its sole provider. Trust me, it will show in your face and defeat the purpose. If you don’t want to be the only one to shell out the cash, you could pool the cost within your department-mates and/or talk to your manager. 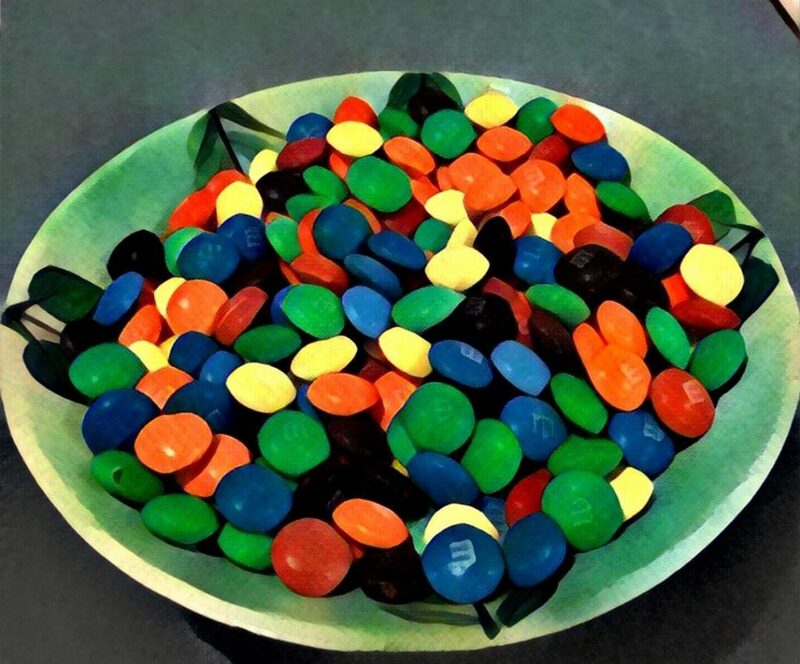 If you try a candy dish as an experiment and you’re seeing results (like stronger relationships, increased collaboration, better information flow, reduction in low-priority research requests, and an increase in targeted/strategic information requests, for example), make a case for it becoming an occasional department budget item. Put the candy dish out of your own reach but not too far away (like in a central area). It should be close enough that you can reasonably start conversations but far enough away that you can ignore the temptation. Rotate the person in your department that has the dish on their desk or in their office. Everyone should benefit from the additional contact with others – and it’s a great way for the shyest amongst us to have help starting conversations. A candy dish is a gracious, fun conversation-starter. Give it a try and see if it helps forge stronger, sweeter relationships between you and your colleagues. Special hat tip to my friends in Research at TCU for the blog post idea!